IGTV is a new feature within the main Instagram app, as well as a new standalone app of its own, dedicated to the sharing of long-form vertical videos. What does this mean for online video-sharing platforms, like YouTube? Are we shifting our way of perceiving the world from horizontal to vertical? “We call it IGTV – we’ve reimagined what video is on mobile and we wanna share it with you today” (Instagram) — as these words sparked an enthusiastic reaction from the crowd, CEO and co-founder of Instagram, Kevin Systrom, announced the launch of IGTV, at a press event in June 2018, right after sharing the news of Instagram’s latest record: becoming a global community of one billion monthly actives. According to Systrom, IGTV was idealised to solve what he saw as the several problems users faced when watching videos “formatted for a TV, on a vertical screen”. The announcement of IGTV — which allows users to post videos of up to 10-minutes or, for bigger and verified accounts, up to 60-minutes — has raised questions whether Instagram was taking aim at YouTube’s reign in the online video-sharing industry. Maybe it is hard to see it now, but we should not underestimate Instagram’s new enterprise. Could we even go as far as saying that Instagram is set to tilt our way of consuming online videos from horizontal to vertical? From our CEO Kevin Systrom (instagram.com/kevin)“Today, we have two big announcements to share. First, Instagram is now a global community of one billion! Since our launch in 2010, we’ve watched with amazement as the community has flourished and grown. This is a major accomplishment — so from all of us at Instagram, thank you!Second, we’re announcing our most exciting feature to date: IGTV, a new app for watching long-form, vertical video from your favorite Instagram creators, like LaurDIY (instagram.com/laurdiy) posting her newest project to King Bach (instagram.com/kingbach) sharing his latest comedy skit. 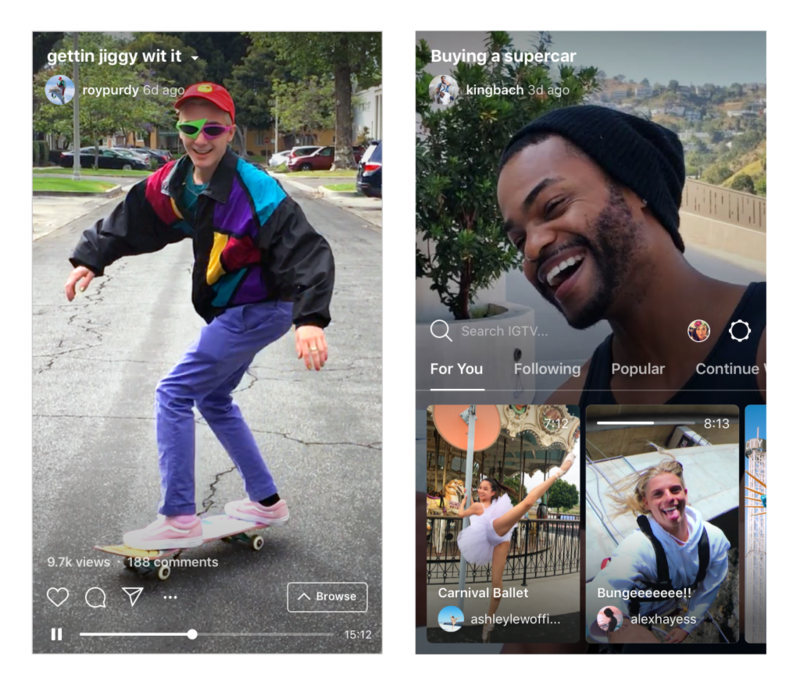 While there’s a stand-alone IGTV app, you’ll also be able to watch from within the Instagram app so the entire community of one billion can use it from the very start.IGTV is different in a few ways. First, it’s built for how you actually use your phone, so videos are full screen and vertical. Also, unlike on Instagram, videos aren’t limited to one minute. Instead, each video can be up to an hour long.We strived to make it simple, too. Just like turning on the TV, IGTV starts playing as soon as you open the app. You don’t have to search to start watching content from people you already follow on Instagram and others you might like based on your interests. You can swipe up to discover more — switch between “For You,” “Following,” “Popular” and “Continue Watching.” You can also like, comment and send videos to friends in Direct.Also like TV, IGTV has channels. But, in IGTV, the creators are the channels. When you follow a creator on Instagram, their IGTV channel will show up for you to watch. Anyone can be a creator — you can upload your own IGTV videos in the app or on the web to start your own channel.Instagram has always been a place to connect with the people who inspire, educate and entertain you every day. With your help, IGTV begins a new chapter of video on Instagram. We hope it brings you closer to the people and things you love.”IGTV will be rolling out globally over the next few weeks on iOS and Android. By stressing the importance of having a platform that (only) supports vertical videos, Systrom is referring to our modes of visual perception. In regards to this topic, it is worth mentioning Walter Benjamin’s assessment of our modes of perception: ”The manner in which human sense perception is organised, the medium in which it is accomplished, is determined not only by nature but by historical circumstances as well” (Benjamin 222). Historically speaking, our perception of visual content in a horizontal perspective was fostered by the development of visual media that supported such perspective, from photography, to films, and television. As for online platforms dedicated for sharing videos, such as YouTube, horizontal perspective was still a visual norm. However, the development of mobile devices exposed us to a technology that was designed to be held upright, thus influencing our way of consuming that content in a vertical perspective (Thompson). However valid this point may be, the success of online streaming platforms such as Netflix — producing TV-like material meant to be watched horizontally — may counter attack this notion of a supposedly inevitable shift of our visual perspective from horizontal to vertical. Understanding this conflict is important. John Berger said: “Every image embodies a way of seeing” (Berger 10), that is, a way of seeing that speaks directly to the perception of the creator of this content. When it comes to apps, these modes of perception are influenced by what Thaler and Sunstein described as the “choice architect” (3), those in charge of designing the context in which we make our decisions — which for IGTV, could refer to the creators of visual content or/and to the creative minds behind Instagram and IGTV, and how their design of the app’s interface influences our interaction with it. Furthermore, Berger mentions how our perception also depends on our own way of seeing. But to understand the way we see it, we have to analyse what the features of these apps allow us to do, that is, their affordances. Digital platforms reflect assumptions about what we will do, but through their affordances, they also establish “a normative claim about what Users should do” (Stanfill 1062). So, in these terms, IGTV is working towards consolidating vertical videos as a new norm, one that speaks directly to Instagram’s agenda — let’s not forget that Instagram has set its grounds in mobile devices. If you have used IGTV, you will have already noticed that there is no elaborate interface. When you click on the app, a video automatically starts playing. By swiping up, a simple overlaid feature allows you to scroll through different vertical videos: from accounts you already follow, from the most popular ones or from a “For You” section. The latter hinges on a massive database, which is processed by what Gillespie called public relevance algorithms, which amongst other things, sees the users’ inputs and interactions as “means by which the algorithm approximates ‘relevance’” (Gillespie 175). This sits well with Systrom’s affirmation that one of IGTV’s goals is to provide quality: “You want the best videos, not just all videos”. Moreover, Systrom also addressed in his speech the practice of consuming horizontal videos in our phones by categorically referring to them as “problems”, as being “old and out of date”. IGTV emerges, then, as the solution to these problems. If we borrow Morozov’s concept of solutionism, he is criticising not “their proposed solution but their very definition of the problem itself” (16), that is, seeing problems as problems just because there are technological solutions available for solving them. Maybe IGTV’s mission is to solve a problem that they have created and perpetuated themselves, by disseminating a norm of consuming videos in a vertical perspective. IGTV might still be fairly new, but the possibilities for its use show some signs that it could eventually become a direct threat to YouTube. For instance, Instagram is already exploring strategies for creators to monetise over the content they post to IGTV (Spangler); they are also encouraging the production of episodic videos, which has shown a growing popularity amongst users (Peterson). IGTV is still far from matching YouTube in their number of active users. But it could possibly be posing a future threat (Bell). Let’s take Snapchat as an example. While we can’t solely attribute this to Instagram, it is known that the creation and rapid growth of Instagram Stories coincided with a major drop in how fast Snapchat was growing (Constine), and as of June 2018, Instagram Stories had 400 million daily active users, which is more than twice the number of people who access Snapchat every day (Price). Instagram’s IGTV is still in its infant stages, so it is hard to posit whether it will establish a new norm of consuming online videos in a vertical perspective. We must, however, pay close attention to how this new platform will unfold and how it will be received by creators and users. IGTV could be just a small glimpse into what potentially could be a new era of online video consuming practices. Bell, Karissa. “Instagram challenges YouTube with IGTV, a new app for creators”. Mashable. 2018. 19 September 2018. <https://mashable.com/2018/06/20/instagram-igtv-launch-longer-video/?europe=true#Ip19DhEhtaqi>. Benjamin, Walter. “The Work of Art in the Age of Mechanical Reproduction”. Illuminations. Ed. Hannah Arendt. New York: Schocken Books, 1969. 217-251. Berger, John. Ways of Seeing. London: Penguin. 1972. Constine, Josh. “Snapchat growth slowed 82% after Instagram Stories launched”. Tech Crunch. 2016. 15 September 2018. <https://techcrunch.com/2017/02/02/slowchat/>. Gillespie, Tarleton. “The relevance of Algorithms”. Media Technologies. Eds. Tarleton Gillespie, Pablo Boczkowski, and Kirsten Foot. Cambridge: MIT Press, 2014. 167-193. Instagram. “@kevin announces IGTV”. Instagram. 20 June 2018. 19 September 2018. <https://www.instagram.com/tv/BkQjCfsBIzi/>. Morozov, Evgeny. To Save Everything, Click Here: The Folly of Technological Solutionism. New York: PublicAffairs, 2013. Peterson, Tim. “Instagram’s IGTV sees growing popularity of episodic videos”. Digiday. 2018. 17 September 2018. <https://digiday.com/media/instagrams-igtv-sees-growing-popularity-episodic-videos/>. Price, Rob. “Instagram’s Stories feature is now twice as big as Snapchat, with 400 million daily users”. Business Insider. 2018. 20 September 2018. <https://www.businessinsider.nl/instagram-stories-400-million-daily-active-users-snapchat-2018-6/?international=true&r=US>. Spangler, Todd. “Instagram Still Exploring How IGTV Will Make Money for Creators”. Variety. 2018. 22 September 2018. <https://variety.com/2018/digital/news/instagram-igtv-monetization-1202930549/>. Stanfill, Mel. “The interface as discourse: the production of norms through web design”. New media & society 17.7. (2015). 1059-1074. Thompson, Clive. “Phones are changing how people shoot and watch video”. Wired. 2017. 20 September 2018 <https://www.wired.com/story/thompson-smartphone-video/>. Thaler, Richard H. and Cass R. Sunstein. Nudge: Improving Decisions About Health, Wealth, and Happiness. New Haven & London: Yale University Press, 2008.